The soft silence of the open road is only punctuated by the sound of cold wind whooshing by your face, the hum of the engine and the crunch of gravel beneath the massive 140mm rear tire. You are a rebel set upon the path of self-discovery, to find what lies beyond the horizon and to obey no-one but the sound of your true calling. The Commando's low-slung seating, nostalgic lines and wide-set handlebars were inspired by vintage American military bikes built for long hours of riding out during missions. 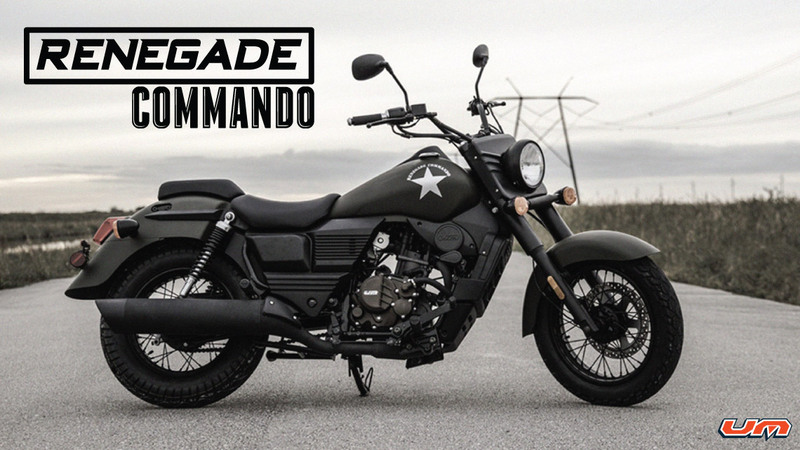 The Commando features a bulky petrol tank with integrated instrument gauge for a clean handlebar look and wide metallic fenders for tough road conditions. The front brake with radially bolted floating 2 piston calliper and massive 280 mm disc ensures precise and safe braking on every terrain. The Renegade Commando is equipped with the best technology to make sure you have a safe ride: Blind spot mirrors and Anti-flat system. So sit back and enjoy the ride, we are looking after you. The Commando is powered by a strong and reliable single cylinder, 4 valve, liquid cooled engine which delivers 25bhp and 22 Nm of torque mated to a 6-speed transmission that is geared for city use in low gears and equipped with an overdrive for comfortable highway riding in 6th gear. You can now experience a long, sturdy bike ride without the worry of a flat tire from screws, glass or loose debris. This eco-friendly tire sealant not only improves safety but also convenience. The Commando features and ergonomic riding position with pulled-back narrow handlebars for an easy city commute; centred footrests for upright seating and a wide cushioned seat for hours or riding while you Feel the Freedom.